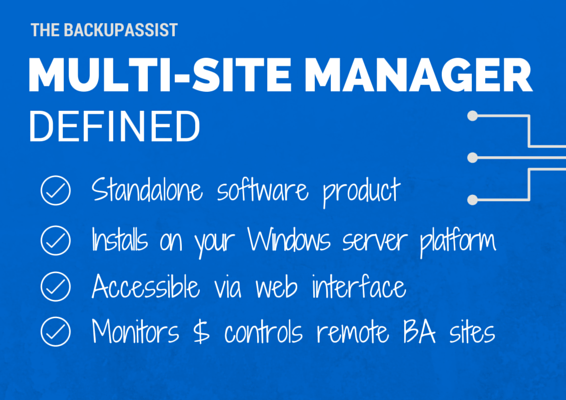 Are you managing more than a handful of BackupAssist installations? Spending more time than you’d like checking email reports? 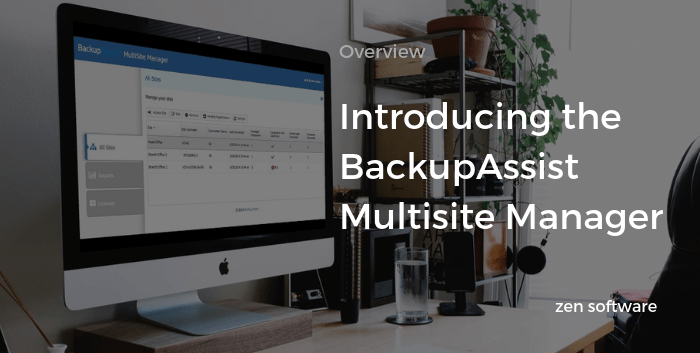 Let me introduce you to the BackupAssist MultiSite Manager, a magnificent standalone utility that’ll not only help you manage your installations but also save you oodles of time monitoring them. Please note: BAMM is the replacement for BackupAssist’s legacy Centralised Monitoring Console (CMC) which is no longer supported. What is the MultiSite Manager? The important thing to note about the MultiSite Manager is that it’s a software product and not a hosted service. You are required to provide the Windows hosting platform. What functionality does it offer me? One email is all you need. The most popular feature among the customers and users we have using the MultiSite Manager is the consolidated email reporting. The individual email reports sent by BackupAssist are great, providing just the right amount of detail for small businesses, but by the time you’ve built up ten or more sites, it can become a job in itself to check those individually every day. With BAMM you can log in, check the web console at-a-glance or simply configure a daily report email that will summarise the information from across your various customers sites, making it simple to spot potential issues. View alerts for all backup jobs, for both individual sites and entire networks. The Centralised Monitoring Console was a cloud-based service where data was held on Cortex’s servers. It performed monitoring only. BAMM is a software solution where data is stored on a machine you control and that can be at any location. It will monitor and manage. Fancy more of a guided tour before going any further? Our resident BackupAssist guru (and YouTube star in the making) Neil Perry recorded one of his live webinar sessions and it’s a great place to start taking a closer look. Please don’t forget to subscribe to our channel and ‘like’ Neil’s video if you find it useful! Where do you advise I host it? For testing purposes, we have BAMM installed on an AWS server. That’s performing very well indeed and at a reasonable monthly cost so that route might be worth considering. If you’d like to read up some more, you’ll find plenty of information, help and installation guides in the MultiSite Manager Set-up Guide (BackupAssist.com). Provided you’re a registered member of our partner program at ‘Reseller’ level or above and currently listed as selling BackupAssist, you’ll be able to request an NFR licence. Add either a 1 or 2 year BAMM licence to your shopping basket here. If you’d like to ask any questions by all means drop us a line in the usual ways.